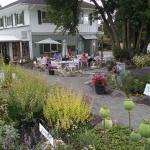 Garden to table, licensed restaurant, local organic fare, dedicated gluten-free kitchen. Outside dining, private event room and catering services. Check web site for seasonal hours. Built in 1880 by Englishman John Bell, the Bell House has been a Sequim landmark for over 100 years. With only seven owners since it was constructed, remarkably, the home has maintained its original integrity. In the 1960s, Karman and Don McReynolds, with their daughter Toni, developed the property into one of Washington’s oldest herb farms.